I hope this finds everyone well. Please write some intelligent words based on your understanding of this module. This is a good time to pose questions to demystify anything that needs clarification. Codependency has so many meanings. (enable, control, manipulate,in need,insecure) . These are just to name a few, in my opinion. 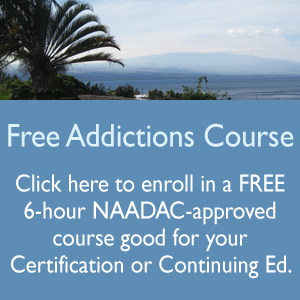 I found through my experience with substance abuse a great deal about codependency. Substance abuse = codependancy. But you do not have to be an addict to be codependent. It could go back to the way you were brought up in your family. Codependent people find comfort in people with problems. they will sometimes give up there comfort or independance for there spouses comfort. Insecure or people into control feed off of each other emotionally and socially. They sometimes rely on others opinions to secure there thoughts or comfort zone. Comming from addiction and my experience of being co-dependent in a dominant run household, your thoughts ring true for me. I agree with the idea that co-dependent people give up their independence for their spouse/partner or whomever. I believe it is in the dis-empowering act of “giving up,” as you say (which reasonably is caused by fear), of one’s individual capacity that enables the opposite to attract in the first place. For example, if I didn’t allow others to be able to preceive of my “weakness” or submission by giving up my own power as an individual to say NO Thank You, I wouldn’t allow the experience for some of my older brothers to “dominate” over the sibling household territory. I gave up my power in my own fear and this allowed for another to fill that void up with their heightened suppression of me! Only in my dis-belief of my self in my own perceived weakness could I’ve become co-dependent on my other brothers to fill the “void” which I created. However, the expereince and “sufferring of dis-empowerment forced me to move beyond that co-dependency as I stopped identify myself with them and came to find the power within me to say NO to whatever the dynamic in co-dependent relationships brings. This was such a great module. I really got into it and I was also disappointed that it could not be done in the classroom. Discussions based on peoples views, opinions, and experiences would of given everyone else a chance to be exposed to situations they would not have been normally. Of course I did a lot of self reflecting and analyzing of my own personal relationships, anyone providing human services should probably start there first. Many of my previous relationships, whether they were personal or professional, unfortunetly involved some level of codependency. Fortunetly, I finally got it and was able to identify the importance of breaking that relationship cycle. Finding and maintaining “balance” is not always easy for me. I am a compassionate person and have had the tendency to enable those in need. I was never able to describe what that “balance” should look like until I read your statement about togetherness and individuality. Those experiences have given me the ablity to be more patient with the people I serve, remembering that every family’s dynamics are complex and stem from experiences that I may have NOT experienced myself and I try to focus on helping them through encouragement and just being humble because no one is perfect, except for God. Understanding Codependency,this module has so many touch and go discussions that could go on forever.Especially where relationships are of concern and indivduality is managed by emotional anxiety. When we differentiate our inner self how do we really know that we could stay calm and be able to make rationale dicisions?I could be doing an assessment on an individule and follow all the example,but what else is there? Understanding codependency….For me this question has usually revolved around the question of where do I end and you begin? Is it possible to show concern and care for another without becoming codependent. Upon further introspection I have discovered that I can still care and not be codependent. I think it is called compassion….I am not good at it , but I am getting there! This module also helped solidify my beliefs in codependency. It really isn’t the behavior of caring/caretaking that is at issue…it is my motivation. What am I going to get out of this? Will I feel whole, purposeful? Do I need this person/situation to feel in control?? I have seen overt codependency destroy lives…spouses that stay in abusive situations, children that continue to care for an addicted family member when they should cut the cord, so to speak…etc etc. I believe ultimately “codependency” is the root, what lies below the tip of the iceberg that keeps people sick. Co-dependency, as defined by merriam-webster ,is a psychological condition or a relationship in which a person is controlled or manipulated by another who is affected with a pathological condition (as an addiction to alcohol or heroin); broadly : dependence on the needs of or control by another.In which “we” would tend to think of a perpertrator and a victum. But that is not always the case. There are ways that Co-dependency is a factor. Such as a marriage, most times people depend on their other half to “pull their weight” or to exactly that, half. Many relationships consist of one person taking care of certain tasks while the other takes on the remaining items. Most of the time it is an unspoken agreement and for the most part people are unaware of the “tasks” they are assigned, but continue to do so. Personally, I feel that co-dependency depends on the stability of the relationship. Sometimes I “lean” on my parents for guidance or advice and sometimes they lean on me. It’s a two way street. Where when one is in a vulnerable state, the “stronger” one overcompensates and takes the lead and vice versa. We are all different in how we react and behave in situa-tions. Maybe you’re not sure if you are codependent. Maybe the signs aren’t so clear. The codependency module was one of my favorite’s along with the relapse one. Some of the module was a review while some was new, or at least I am in a a new ’emotional’ place to understand the information more fully. I like the ‘diffentiation of self’ concept, as there was dysfunction and enmeshment in my family. It is good to have a name for the some of the feelings I have/do experience, as a result. I beleive and like the concept of the ‘multigenerational transmission process’ as well. I equate it to the old saying ‘the sins of the fathers’… but one can make a choice to ‘stop’ the dysfunction/insanity by moving into and through the recovery process; using the word recovery loosely as movement toward improved mental health and quality of life. Rich material that I could go on and on about….